Today my husband and I celebrate fourteen years together and I am so very grateful for his unconditional love and support in a world full of conditions. It is amazing how one that I did not know for 23 years could now be more family to me than family. A great man of faith, when we lost everything we saved in our first five years of marriage and a pecan grove that went under water, he went back into engineering and we agreed, "God doesn't give demotions." As he moved ahead and five years later when he was laid off due to downsizing the Monday before Thanksgiving, we again struggled and said, "God doesn't give demotions." He moved back into manufacturing engineering, his gift, and continued to work hard every day sometimes loving it, sometimes, well, you know. As he worked so very hard, he has been promoted several times and this past week was named Engineering manager for his manufacturing plant. Though we couldn't see, there was a plan and I am so thankful. He truly deserves it. He is a great man...sticking it out when most would quit...doing his best when no one noticed...taking lateral moves into tough jobs knowing it would fill in gaps in his knowledge base...keeping faith although his parents died too young. He has every excuse to be broken beyond repair and yet, he is not. He is my model of perseverance, love, and faith. My favorite song for him is "I can't smile without you" which is so true. It is his love and belief in my dream of being an inspirational writer that keeps me coming back to this blog and writing. Some would accuse me of being sappy, but insofar as I remember, I've been blogging for close to two years and never wished him happy birthday or anniversary. So, today, honey, this blog is for you. Happy Anniversary! This is a great post about 30+ tagging tools from Mashable.com to help you make meaning out of tags. I put it through delicious but wanted to make sure everyone sees it. We'll definitely be using it in current events this year and as we research trends in IT in our classroom! Wow! Let me know if you've used any of them, most of them are new to me. ccLearn is a division of Creative Commons which is dedicated to realizing the full potential of the Internet to support open learning and open educational resources (OER). Our mission is to minimize barriers to sharing and reuse of educational materials — legal barriers, technical barriers, and social barriers. This is a great thing! So many educators shy away from everything with digital storytelling and podcasting for fears of making a mistake... after all ignorance does not always mean innocence. I look forward to the methods they will use to educate teachers about it! I enjoyed learning about ccLearn from Paul Trafford over at Educause who saw a presentation recently about Open Courseware Sustainability and ccLearn's part in that. I'm excited about the WOW2 show tonight! It will be on at 9 pm Eastern Daylight Savings Time (that is Atlanta, GA time for those who want to convert it) at edtechtalk.com. Although many are excited about Second Life, as I saw with my students last spring, it is not ready for students (unless you have the funding to buy a private island and the hardware), but there are many colleges that have some incredible learning environments that ARE safe for students and provide meaningful, genuine learning experiences, tonight we will feature several such programs as we talk with Jeff Stanzler: UM School of Education faculty and Director, Interactive Communications & Simulations. One [idea for the show] would be the mentoring model that we've evolved, both in terms of the logistical model (university students take courses in which they receive support for engaging in reflective mentoring practice) and the idea of placing college students in a position to take what they're learning about and put it into action--to learn by teaching. Each of the ICS curricular projects is linked to a seminar course, affording U of M students the opportunity to earn course credit for working with younger students on our simulations and writing projects. Fundamentally, we've attempted to create compelling spaces for our student participants to explore their thinking and exercise their creative imaginations, with the support of university students, whose work is central to maintaining a safe and inviting learning space. As a consequence, the "mentor seminars" are a crucial part of our work, as we endeavor to tap into the interests and passions of our university student mentors while building their pedagogical skill sets, and foregrounding reflective practice. A second would build on the elements of theatricality and creative play that are at the roots of our simulation work. We believe that students (even HS students) often need a place--at school--in which they can engage in thoughtful play. Both of our simulations--and especially Place out of Time--are designed to ask student participants to take on historical figures, to attempt to get a feel both for the history of that figure and for the kind of person they are...to use language and rhetorical flourishes to convey the details of one's character, and sometimes (through the cover of speaking in character) to be able to challenge one another in ways that would be awkward without the emotional "cover" of one's character. In terms of our conversation, this is important because Maurita has long been interested in imagining ways to put the information resources that reside at the U (she was the long-time Director of the Internet Public Library) in the service of the learning of K-12 students and their teachers. The idea of using "serious play" to animate this need for information and guidance to information resources is a big part of what drew Maurita to this project. As Co-Director of the Oakland (MI) Writing project, Pete is deeply interested in using writing-based activities to illuminate cross-curricular links for teachers, and in working collaboratively (K-12 and U educators) to create alternative paths to get at the curricular standards/benchmarks that teachers must attend to. Because of this, the Oakland Writing project took the initiative to draw together the team of K-12 and university educators that Pete led in the creation of Michigan Matters two years ago. I hope to see you there. Sharon and I will be cohosting tonight and wish Cheryl and Jennifer well on their vacation time before school starts again. We will then take three weeks off and start with our back to school show on August 21st. 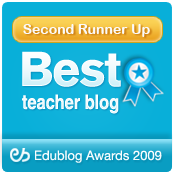 September 18 2.48 - (Vicki moderates) Dean Meyer - used 5th graders to teach his teachers blogging - We will be added several other people who have used students to assist in teaching teachers. October 16 2.52 -- ANNIVERSARY SHOW -- David Warlick -- Tentative! October 30 2.54 -- Vinnie Vrotny, Principal using Moodle in Internet safety education programs. If you have an idea for a show or someone who needs to join a show, just leave a comment here or e-mail me. I get somewhat irritated when I read posts like this one: The Apocalypse is Nigh, Stager of Twitter, Flickr, and NECC which is based upon another article, Twittering While America Burns. Less than 25% of Detroit students graduate. And those are the examples I thought of in the last seven seconds. I don’t expect all educators to lend their manpower to all causes, especially when some are better suited than others to tackle a particular problem. I do, however, expect educators to behave like professionals and put their respective issues into proper perspective. Mr. Stager was quite right to call you out and I support his point in full. To those who have spent their day “Twittering,” I’ll issue to you a hearty, “Grow up.” If I’m wrong about the value of Twitter, Flickr and others, let me know - I’m interested in hearing your case. The bottom line is that it is connecting us and while you may look at it and immediately jump in and criticize, if you look at the other things that those connecting through twitter are doing, you’ll see projects like that of Julie Lindsay and I which are included in Thomas Friedman’s upcoming update to the World is Flat on educational activism. We connected five classrooms in Bangladesh, Austria, Australia, China, and my classroom in Georgia USA to study the trends in IT and actually have a meaningful project. Do I twitter, yes! 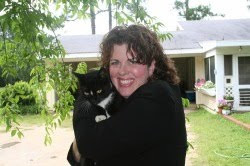 But I also am working on a project, connecting with other teachers, and although I am a private school teacher, doing my very best to find a public school to connect with the kinds of global projects that need to happen in America’s typically ethnocentric education system. My zeal is for effective meaningful, engaging education and sharing the best practices that I am using in my classroom which happens to be a technology classroom, I am however, working with english, math, and other classrooms. I too am alarmed about many of the issues in education and am doing my part — but to single out what is happening with Twitter is again making educators who are often islands of excellence retreat and be disconnected. Most teachers quit within the first three years because they feel isolated and alone and if twitter gives them a connection with others who are struggling through the system like them then bring it on. I’m sorry that those who just take a cursory look seem to jump to conclusions and lump everyone together — if you look at most, there are very few who spend “all day” twittering — it is just not so. The education blogosphere is in overdrive this summer with discussions of edugaming, all things Web 2.0, Flickrs of NECC photos and abstract ruminations on school reform. The virtual aspects of schooling are well represented in these discussions. Far less represented are the actual problems that require immediate attention. What you're seeing in the edublogosphere is not representative of the leadership in education, it is just not. Many of us are technology people so we write about technology. We've had many discussions on how more researchers, administrators, and policy makers involved in education need to move into the edublogosphere, but as of yet, with the exception of a few, they have not. I think what you are seeing is more a reflection of the make up of the blogosphere than the fact that the edublogosphere doesn't care about these issues. I also think that the summer is not the best time to see meaningful debate as many people are taking time off. To ask the edublogosphere to be all things to all people in education is not realistic because we do not as of yet have a well-represented mix of all layers of the educational system. In fact, you'll see that many state education teacher organizations (like Pennsylvania) have in fact come out and told their teachers that it is unethical to blog at all (which I think is preposterous.) Twitter and other tools are ways that facilitate connections between us and it may look a bit "silly" while many newcomers come on board, however, I will say that many of the most meaningful important things that I will use in my classroom have come through twitter. I am a classroom teacher and that is what I write about mostly because that is my area of interest. There are quite a few in the blogosphere that are talking about these articles, I'm wondering why there are not more comments? I don't have a lot of time because teaching and working on projects takes so much of it, but the microblogging feature of twitter really helps me keep up. I care less about defending twitter per se as in reflecting that there are many of us edubloggers who do care and who are working diligently to do our part to help education as a whole. No doubt we have so many issues to tackle in the education system in America. We all have to do our part, but to expect a person or blogger to be what they are not is not realistic. I think this is a call to get a more diverse representation of education blogging. Respond as you see fit. Show that we do tackle meaningful, important issues in our sphere of expertise. I am thankful to be a part of the edublogosphere, I was an island, alone and thinking of quitting teaching altogether because of my own frustration. I am connected, energized and better than ever and get e-mails daily from those I've helped and who in turn are passing it along to others. Connecting teachers is a great thing! I don't see anything wrong with that, don't let this stop you from connecting. Was just going through Joyce's favorite tools over at the School Library Journal Blog and came across Big Huge Toy's FD tools for Flickr including this cool Motivational Poster Maker -- how cool to create and make posters that include your students! If you sign up for an account, you have 3 days to set up high res images and if you have a poster printer at school, get busy -- so cool! Thanks, Joyce, the whole article is a Gem! The Crash of the Internet! See the video here! Hat tip to this goes to Alec Couros via twitter. Internet Safety Discussion with expert, Linda Criddle - join in! For those of you who have recently joined the blogosphere, there are some great FREE webcasts over at edtechtalk.com with some great educators. You can listen live and participate in the chat (click on chat room) where you can ask questions to the speakers live, or you can subscribe to the podcasts to listen to later. I subscribe to everything at edtechtalk and listen to all of them. There are some college professors and staff developers that require their organizations or staff to select and participate in several shows a month to encourage innovation and participation. It is exciting to see the growth and interest from the audience-- (Some of whom just listen, the chat is optional) and I believe that such live forums are truly the future of our staff development. My little piece of this webcast fun is on Tuesday nights where I co-host the WOW2 show on 9 pm Eastern Time (See the time zone converter) with Jennifer Wagner, Cheryl Oakes, and Sharon Peters and we interview some really neat people. The great thing about the show is the combination of the guests and the chat room -- in fact, every chat is archived because it has become a great forum for sharing and discussing and I often learn as much from the chat as elsewhere. Here in the US, we will all be fielding questions because of the largely publicized Miss New Jersey case where private facebook photos were used to potentially "blackmail" a pageant winner, forcing her to out the embarrassing photos on national TV. She just shared the photos with "friends" on facebook, not realizing that they could be copied and saved. So, tomorrow night, we will learn from Linda. I've read her book look-both-ways and I like it because it is a non-fear practical book that talks about teaching kids to live on the internet like we teach them to cross the road -- how can they "look both ways" on the Internet? Practical tips for teachers to be safe with their students while blogging/ podcasting. What could Miss New Jersey have done to prevent the "virtual blackmail" and what should we as educators do about it? What she thinks should be done at the legislative level about Internet child safety (she has also testified in front of the British House of Commons and advised several other governments in addition to the US). Should Internet safety be mandated like drivers ed? When should students be taught and what? Her new internet safety course for educators (which I'm beta testing, great stuff!) and how you can learn more. There is a lot of conjecture and misinformation. We booked Linda about six months a go, she is a very busy woman but this discussion is so important! Linda is an expert, I hope you'll add your expertise as a teacher! Leave your question here and we'll add it if we're able! Just received this information about the next Webcast Academy. If you're interested, this is a great program! facilitated by Susan Ettenheim and Cheryl Oakes. the completion of the internship. the information and complete the 2 steps at the bottom of the page. We are excited to have you on-board! Please contact me if you have questions. I’ll help you find the answer. I learn about so many cool things on twitter, so much so that I even check it before my RSS reader. Today, Sue Roseman talked about visuwords, the online visual dictionary. Meanwhile, was Skype chatting with my friend, Graham Wegner in Australia, king of smartboards and Web 2 middle school teaching, and I told him about visuwords. He thinks it would be great on the smartboard. Then, he told me about how he likes to use the visual search engine quintura, particularly its kid friendly version quintura for kids. [8:40:15 AM] Mrs. Vicki Davis says: I'm just flipping out how I'm going to use it in class, just blogging it now. [8:41:45 AM] Mrs. Vicki Davis says: ? [8:42:14 AM] Mrs. Vicki Davis says: Never heard of quintura -- is it free and great too? [8:42:22 AM] Mrs. Vicki Davis says: Oh. [8:42:42 AM] Mrs. Vicki Davis says: Oh, I need to look at it. [8:43:35 AM] Mrs. Vicki Davis says: Can I quote you on the quintura thing? [8:43:43 AM] Mrs. Vicki Davis says: Where is the kids version of quintura? [8:43:59 AM] Mrs. Vicki Davis says: And how do you use it in the classroom? [8:44:12 AM] Mrs. Vicki Davis says: So cool. [8:44:39 AM] Mrs. Vicki Davis says: So you use quintura on the smartboard to brainstorm? [8:44:47 AM] Graham Wegner says: My students used it to work out categories for a topic. [8:44:53 AM] Mrs. Vicki Davis says: Cool. [8:44:55 AM] Mrs. Vicki Davis says: I love that. [8:45:24 AM] Mrs. Vicki Davis says: Neat. [8:46:13 AM] Mrs. Vicki Davis says: Wow! Well, it turns out that Graham found about the search engine from Derek Wenmoth from New Zealand - Derek is a keynote speaker in IT in Graham's part of the world. "[Touchgraph] lets you put in your blog url and it gives you a linked in view of your blogging network." "Kartoo lets you type in your name to see your web presence (with others who share your name!)" In fact, Graham sent me a snapshot of the touchgraph he made of my blog -- which is so cool. So, as I look at these amazing visual organizers and the connections that they make, I think about I have just learned through my own connections: I read about a site on twitter, instant messaged to Graham in Australia and learned from him -- he had learned from a blog in New Zealand. And you've just read a blog post that has put all of these together with a photograph created in Australia, websites from various sources around the world and put together within about 20 minutes. Amazing. It is about being connected and learning through the connections. OK, gotta run. If you know of any other great websites that teach with visual connections. Please share. I will re-emerge. I'm quiet and retreated from the world, trying to get things done and resting quite a bit. With the recent loss of my Granny and several other "losses" of late, I've been thinking about this thing called life and how it is truly a roller coaster. No one has the corner on victory and no matter how bad it seems, no one really has the corner on loss either. As I ponder loss and how terrible it can be, I also draw and think upon the things I've learned from history about loss and those who have overcome tremendous loss to continue to make a difference. So, as I journalize, I just thought I'd share a bit about my thoughts on loss and how (I hope) to come out of this. I do not speak as one who has mastered loss or one who is even over it. I speak as one in the throes of loss drawing on my own life experiences and the wisdom of others. This comes from my own Grandmother. My grandfather died suddenly when Granny was a young 59. She said that for the first year she put one foot in front of the other and just tried to make it from day to day. "OK, this is my life and I'm going to enjoy it. I cannot bring him back, but I can live what I have left without regret. Here I am world, and here I go." She proceeded to travel the world: Egypt, Australia, Europe, everywhere -- sometimes with Friends, sometimes by herself with tour groups. She couldn't bring Grandaddy back so she gave herself time and then decided to live again. I try not to make important decisions or write things when I am too upset or two tired, which should explain my recent silence. I will give myself time. I read about a Jewish Christian during the Holocaust talking to her family about how to make it through the tough time and she told them to "put on their 100 year glasses." As a Christian, that is something I can relate to. However, even if we don't look as long term, although there are awards that we'd like to win (I just "lost" one of my own recently - Congratulations to Ben Wilkoff) and places we'd like to present (Julie's and my proposal to run a Horizon Project with educators for K12online07 was cut) in the long term, I suppose I'll barely remember. Now, these two losses came for me right before Granny died. I'm competitive and I like to win awards like the next person. But I don't teach because of any award -- If I wanted that I would have stayed in business and pocketed a five digit paycheck every month -- I don't teach for awards. So, why did I let myself get so all-fired distracted for an award that most likely I could never win? (I am a private school teacher which is often an obstacle for me in the US, though I taught public school teacher staff development for 8+ years.) I guess the problem was that they narrowed it down to two of us so I gave everything I had and came up short. But you know what, there are so many blessings I do have. For goodness sakes, when I want to have a pity party, all I have to do is look at my blog and see you amazing readers out there. And Julie and I won such an incredible award at NECC. I've won a lifetime of awards already and am thankful for every one of them. It all comes down to this dreadful thing that we all fight: ego. That cutthroat nature of mine from the business world comes back at the drop of a hat and that is why I left the business world -- because my own drive to succeed was killing my marriage and motherhood. So, when I experience loss, I have to ask myself -- is it truly a loss or is it wounded pride. In the case of the Wired Educator award, my answer would have to be it was my own pride. "Vicki, keep perspective. This is not about you. It is about doing your best, helping your students, and sharing things that will help other educators. It is about being a good wife and good mother and writing to make other's lives better." Is it tough? Of course. We all want to win all of the time, but it is just not going to happen. And when teachers do win awards, it is often just one in a lifetime and that is OK, we're not in this for gold or for plaques, anyway. My own mother was an amazing educator and left so many indelible marks on the hearts of her students but she didn't win any awards of any kind... and she deserved it. She didn't present at conferences but she taught everyone in sight how to do better an be better - she is a champ! 3. Be willing to help where you're needed. 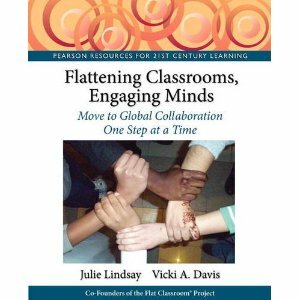 Boy, I was excited about doing the Horizon Project with Julie for you educators. We were going to drop the drapes and let you take part and show you how a global collaborative project is done. I had spent hours planning, too bad that I almost forgot the deadline for K12 online conference and perhaps didn't write the best proposal I could have for this. But you know what, it was turned down. They didn't want it. Sometimes we have great intentions and plan how we're going to help others when there is not a need for that. Sometimes it is not our time and something else is needed. I believe that one day I'll look back and be thankful for the several hundred hours this October that I got to spend on something else. It is humbling to be turned down for anything. But I'll tell you that most people who win more fail more because they try more. I don't know one baseball player who bats a thousand! They have to miss and strike out sometimes and so do I. So do you. We all lose sometimes. 4. It doesn't mean I have to like it. I don't have to like the process of loss. It is like the mouse who was in the cage and had shock administered with no hope of getting away -- eventually, the poor little mouse just stood there and took it shivering and painful even though only the spot he was sitting was electrified. He had lost all hope. I like to use my losses as "tackling fuel" (taken from a great movie the Waterboy -- he envisioned the people who were unkind to him on the helmets of the opposing football team to help him tackle better.) I have to keep my hope and let adversity spur me to be more. It is like when I was in middle school and went home every day for years in tears because I was called "ugly" and a "geek." Or when I was put on the back row of choir in middle school and told to move my lips because I was such a terrible singer! I took that and put it into losing weight and winning beauty pageants (at least for a while) and in learning how to sing. Those unkind words and hurtful experiences went on to drive me to be better. "You'll never make it here you're from po-dunk south Georgia." "I may not be smarter but I can work harder." and put my farm girl back into it and graduated first in my class from Georgia Tech. My good friend Terry Freedman who I value for his honesty and deep thinking, says "The greatest revenge is success" and there is a lot of truth to that. I am going to do the very best I can to help where I'm wanted and that is enough. 5. The only way to lose permanently is to quit. "The way to succeed is never quit. That’s it. But really be humble about it." I find it interesting that the only difference in lose and loser is the r -- or "are" sound. Just because you lose doesn't mean you ARE a loser. To BE a loser, you choose to not get up and fight another day. Winners always get up. How to Win When you Lose? 5) The only way to lose permanently is to quit. I have lots of thoughts on other things but right now, I simply don't have the energy for debate. I'll be "off the grid" with my mom another couple of days and will be back in the midst of the edublogosphere soon. Tomorrow - Tuesday is going to be a great show over at edtechtalk.com at 9 pm Eastern Daylight Savings Time. It will be Wednesday morning for our friends in Australia but they are going to take the time from their winter holidays to talk to us about the great things that they are doing. Here are four of our Over the Top Educators from Down Under, if there are others out there who we didn't invite, consider this an invitation to join us and share the best practices from Australia with the rest of the world. Graham Wegner - Teaching Generation Z - He is really the inspiration that put this together -- it was totally his idea and I appreciate his working to figure out the time. Graham is great and I love learning from him. He did a phenomenal job with middle school peer review for the Horizon Project. and I'm dying to learn more about him. Judy O'Connell - Hey Jude - Another blogging phenom, you need to check out the toolboxes she's been writing about on her blog lately. A must read in my bloglines! Jo McLeay - The Open Classroom - uber-writing expert who has inspired many of us to know that writing and blogging is an excellent form of writing to be taken seriously. Jason Hando - Clever Learning - I first met Jason because of his phenomenal questions that he asked during the first Connectivism Conference by George Siemens. He is doing some exciting work with professional development 2.0 this week that he will talk about. These are just four of the amazing educators from Australia. We hope to continue to include more teachers from around the world. If you have suggestions, let us know! Do you want to learn to webcast: sign up now? The Webheads are phenomenal people and are getting ready to kick off another Webcast Academy on Wednesday nights from 8-9 EST. You will learn how to webcast and do some incredible things as well as meet some super amazing people. My good friend Cheryl Oakes will be working with this session and she is so very helpful! For more information and how to sign up (it is free) go to http://webcastacademy.net/About_Webcast_Academy. I think this is a must-do for any serious educational podcaster and although I cannot do it this time, it is on my list to sign up for when things settle down a bit for me. This song by Nicole Nordeman has the question that I ponder today as we bury one of the inspirations of my life, my grandmother. In order to be effective where we are today, it is vital that sometimes we back up and observe ourselves from afar -- "How will they remember me?" It is important that we look at what we do and rethink how we will be remembered. There are some teachers that propelled me on to greatness and there are some that were unkind and labeled me, and I used them as the angry focus of my determination to succeed. I now live in the hometown where I grew up and there are some people that I look at and remember the birthday party in sixth grade where they invited everyone but me. (And I have to work with the parent that let them do it.) Praise is great but sometimes the wounds go deeper. Life is too short to intentionally make enemies. Get rid of enemies by making them friends, and if you cannot, know that if they talk about you, that means you're doing something -- you cannot please everyone all of the time. Do not let popularity be your greatest aim. Relax and take pressure off yourself. "Sometimes you've got to let the rough end drag." she would always say. Each May that becomes my Mantra. Perfectionists tend to be way too hard on themselves and others, and when times are tough, just do the best you can and that is good enough. Obstacles make a great story. When meeting with obstacles, she always said "Praise the Lord and pass the ammunition." My grandmother was an overcomer of obstacles. She was a very smart lady, but when her brother became deaf and needed to go to a special school for the deaf, she opted to go to work to pay his tuition after high school. She struggled to hold onto the family farm, and then built it into one of the nicest real estate developments in Birmingham self-educating herself and learning the real estate business and getting licensing -- all without a college education. She did her own tax returns until she was 82 including all of the trusts and complex legal arrangements and land holdings. Obstacles never stopped her, she saw them as a great story waiting to be born. There are so many more things that she taught me, but as I wait to be picked up to go to the cemetery and sing at her graveside "It is Well with my soul" I know this -- she has left a legacy of love and goodness in my life. So, as I blog, I see each post as a remnant of legacy to be left behind for my own children. I want to inspire them to overcome, be more, do right, and love each other. There are many others in the blogosphere who have this kindred feeling of leaving a legacy and it is an undeniable part of what we all do. Pointers to some great recordings and resources from NECC. Thank you to Steve Hargadon for making an mp3 of the presentation that Adam Frey and I did about wikis in education. I met Doug Johnson of the Blue Skunk Blog and was, well, totally impressed. Here is a podcast of his lecture, Classrooms and Libraries for the Net Generation. I listen to Doug as do many. There are a lot of other great podcasts I haven't gotten to yet on the Official podcast channel of NECC and the webcasts are just being posted. If I seem quiet, I am. Those who follow me on Twitter, know that my grandmother has taken a turn for the worse (it started the Sunday of NECC), and pretty much any breath could be her last. It puts things in perspective so I have been been spending time with my kids, my family, and just spending a bit of time alone to think and grieve. We are a very close family and although we knew it was coming, it doesn't make it any easier. And, although my blog ranking will inevitably suffer (as it already has-- it happens when one blogs a little less frequently thus generating less links) -- then so be it. This is about ranking first things first. My family and my own internal psyche have to come before my blog. Violence and Rumors of Violence -- When I wrote about school lockdowns, the amazing part of this was in the 14 comments from educators. They are worth a read. The Frontier of Education: Web 3D *- This is my most read post from this school year and will top my list as I'm working to create my own personal list of best posts of the year. Again, great discussion in the comments. Including a Classmate with Leukemia Through Skype -- I met Brian Crosby at NECC, he is the real thing. Help Me Pick out a Mac For my sister -- The great help from the blogosphere when my sister picked out a Mac. Great if you're shopping. I am Thankful for these Websites* - My favorite websites of 2006. Still up to date. These give you some things to look on. Each year, I come up with my year's best posts and these are from the list. I hope you're taking time to spend with your family -- the present is a present we should not neglect -- the eyes of one you love full of that spark and gleam are not guaranteed tomorrow but are to be savored and loved today. I will check in with you soon -- if I'm quiet a while, it is because I have to be. I will return soon enough and hope that some readers will hang around while I'm on a bit of a hiatus to be with my family.